The major cause of cemented Total Knee Arthroplasty (TKA) failure is aseptic loosening of the tibial component necessitating revision surgery. Recently, multiple techniques have been described to maximize cement penetration depth and density in the proximal tibia during TKA to potentially avoid early loosening. While cement polymerisation is an exothermic reaction, minimal investigation into the proximal tibial thermal safety margin during cement polymerisation has been undertaken. In animal models osseous injury occurs at temperatures greater than 47 °C when applied for one minute. The aim of this study was to investigate the cement bone interface temperatures in TKA using modern tibial cementing techniques with a cadaveric tibial tray model. Eight adult cadavers were obtained with the proximal tibial surface prepared by a fellowship trained arthroplasty surgeon. 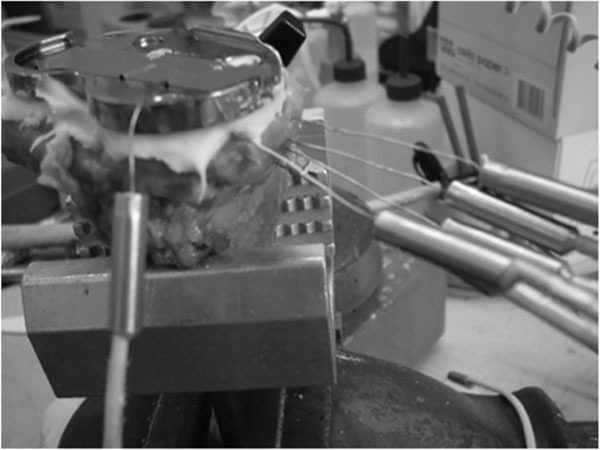 Third generation cementation techniques were used and temperatures during cement polymerization on cadaveric knee arthroplasty models were recorded using thermocouples. The results showed that no tibial cement temperature exceeded 44 °C for more than 1 minute. Two of the eight cadaveric tibias recorded maximum temperatures greater than 44 °C for 55 seconds and 33 seconds, just less than the 60 seconds reported to cause thermal injury. Average maximum polymerization temperatures did not correlate with deeper cement penetration or tray material. Maximum mantle temperatures were not statistically different between metal and all polyethylene tibial trays. Our investigation suggests that modern cementing techniques result in maximum mantle temperatures that are less than previously recorded temperatures required to cause thermal osseous injury, although this thermal injury safety margin is quite narrow at an average of 4.95 °C (95% confidence interval ± 4.31). Keywords: Bone Cement, Cement Mantle, Cementing Techniques, Knee Arthroplasty, Polymethylmethacrylate, Thermonecrosis, Total Knee Replacement. © Vertullo et al. ; Licensee Bentham Open. Cementation of Total Knee Arthroplasty (TKA) with polymethylmethacrylate (PMMA) remains the gold standard and most common method of TKA component fixation. The major cause of TKA failure is aseptic loosening of the tibial component necessitating revision surgery [1AJR. Australian Orthopaedic Association National Joint Replacement Registry Annual Report 2013 [Internet] 2013. Australian National Joint Registry; 2013 [cited 29th Jun 2014]. Available from: https://aoanjrr.dmac.adelaide.edu.au/documents/10180/127202/Annual%20 Report%202013?version=1.2&t=1385685288617]. Ever increasing numbers of TKA surgery performed make it vital to reduce the burden of subsequent revision procedures. In the United States, the recent growth in revision TKA (13.5%) was more than twice the growth in primary TKA rates (6.1%) [2Kurtz SM, Ong KL, Lau E, Bozic KJ. Impact of the economic downturn on total joint replacement demand in the United States: updated projections to 2021. J Bone Joint Surg Am 2014; 96(8): 624-30. [http://dx.doi.org/10.2106/JBJS.M.00285] [PMID: 24740658] ]. PMMA penetration into the cancellous bone of 3-4 mm prior to polymerization is considered ideal to attain adequate component stability by achieving microlock with at least one level of transverse trabeculae and sufficient curves in the vertical channels [3Walker PS, Soudry M, Ewald FC, McVickar H. Control of cement penetration in total knee arthroplasty. Clin Orthop Relat Res 1984; (185): 155-64. [PMID: 6705374] ]. Recently, multiple techniques have been described to maximize cement penetration depth and density in the proximal tibia during TKA. These modern cement penetration maximization techniques include the leg lift technique [4Dorr LD, Lindberg JP, Claude-Faugere M, Malluche HH. Factors influencing the intrusion of methylmethacrylate into human tibiae. Clin Orthop Relat Res 1984; (183): 147-52. [PMID: 6697581] ], timing of cement mixing(4), negative pressure intrusion [5Banwart JC, McQueen DA, Friis EA, Graber CD. Negative pressure intrusion cementing technique for total knee arthroplasty. J Arthroplasty 2000; 15(3): 360-7. [http://dx.doi.org/10.1016/S0883-5403(00)90762-9] [PMID: 10794233] ], cement pressurization devices [6Kim YH, Walker PS, Deland JT. A cement impactor for uniform cement penetration in the upper tibia. Clin Orthop Relat Res 1984; (182): 206-10. [PMID: 6692615] ], pulsed lavage [7Ritter MA, Herbst SA, Keating EM, Faris PM. Radiolucency at the bone-cement interface in total knee replacement. The effects of bone-surface preparation and cement technique. J Bone Joint Surg Am 1994; 76(1): 60-5. [PMID: 8288666] ] and altered tibial tray undersurface morphology [8Vertullo CJ, Davey JR. The effect of a tibial baseplate undersurface peripheral lip on cement penetration in total knee arthroplasty. J Arthroplasty 2001; 16(4): 487-92. [http://dx.doi.org/10.1054/arth.2001.22270] [PMID: 11402413] ]. Excessive cement penetration depth into cancellous bone during total knee arthroplasty has previously been recommended against [9Huiskes R, Sloof TJ. Thermal injury of cancellous bone following pressurzed penetration of acrylic cement. Trans Orthop Res Soc 1981; 6: 134.] due to a possible thermonecrosis risk [10Huiskes R. Some fundamental aspects of human joint replacement. Analyses of stresses and heat conduction in bone-prosthesis structures. Acta Orthop Scand Suppl 1980; 185: 1-208. [PMID: 6938104] ]. Seeger et al has shown that pulsed lavage leads to an increased femoral cement penetration without the risk of heat necrosis at the bone-cement interface [11Seeger JB, Jaeger S, Bitsch RG, Mohr G, Röhner E, Clarius M. The effect of bone lavage on femoral cement penetration and interface temperature during Oxford unicompartmental knee arthroplasty with cement. J Bone Joint Surg Am 2013; 95(1): 48-53. 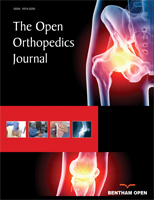 [http://dx.doi.org/10.2106/JBJS.K.01116] [PMID: 23283372] ], although minimal investigation into the thermal characteristics of polymerising PMMA in total knee arthroplasty using modern cementing techniques has been undertaken. The mixing of co-polymer polymethylmethacrylate powder with methylmethacrylate monomer to form crystal PMMA is an exothermic event [12Li C, Kotha S, Mason J. Evaluation of the effects of implant materials and designs on thermal necrosis of bone in cemented hip arthroplasty. Biomed Mater Eng 2003; 13(4): 419-28. [PMID: 14646056] ], as 100 grams of monomer produces 13 kilocalories [13Meyer PR Jr, Lautenschlager EP, Moore BK. On the setting properties of acrylic bone cement. J Bone Joint Surg Am 1973; 55(1): 149-56. [PMID: 4691652] ] of heat, which can produce in vivo temperatures of greater than 100 °C [14Preininger B, Matziolis G, Pfitzner T, Hardt S, Perka C, Röhner E. In situ tele-thermographic measurements during PMMA spacer augmentation in temporary arthrodesis after periprosthetic knee joint infection. Technol Health Care 2012; 20(4): 337-41. [PMID: 23006913] ] in cement spacers and in vitro temperatures greater than 122 °C [15Ohnsorge J, Kroesen A. Thermoelectric temperature measurements of the tempered bone cement, “Palacos”. Z Orthop Ihre Grenzgeb 1969; 106(3): 476-82. [PMID: 4242679] ]. Thermonecrosis of bone has been demonstrated in animal models [16Albrektsson T, Eriksson A. Thermally induced bone necrosis in rabbits: relation to implant failure in humans. Clin Orthop Relat Res 1985; (195): 311-2. [http://dx.doi.org/10.1097/00003086-198505000-00037] [PMID: 3978966] ] above temperatures of 53 °C when applied for greater than 1 minute, with bone remodeling occurring 3-5 weeks after the thermal event. Bone formation is reduced at temperature between 47-50°C for one minute leading to bone resorption and fat cell degeneration [17Eriksson RA, Albrektsson T. The effect of heat on bone regeneration: an experimental study in the rabbit using the bone growth chamber. J Oral Maxillofac Surg 1984; 42(11): 705-11. [http://dx.doi.org/10.1016/0278-2391(84)90417-8] [PMID: 6593442] ], while no significant effects are observed at 44 °C for 1 minute. Hence the extent of thermal injury to bone occurs over a narrow temperature range and is time dependent. 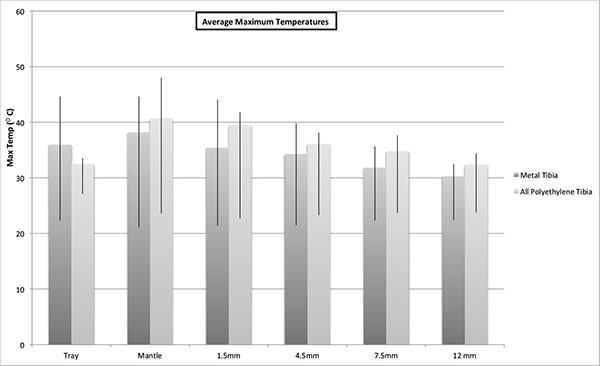 Average maximum temperatures in various recording sites of tibial tray cement models. Investigations reporting thermal damage to bone during total hip replacements has been well reported [18Whitehouse MR, Atwal NS, Pabbruwe M, Blom AW, Bannister GC. Osteonecrosis with the use of polymethylmethacrylate cement for hip replacement: thermal-induced damage evidenced in vivo by decreased osteocyte viability. Eur Cell Mater 2014; 27: 50-62. [PMID: 24464728] ], however there is scant literature of the effect of modern tibial cementation techniques on maximum tibia temperature and time of thermal exposure. Thicker cement mantles as a result of modern cementation techniques could result in higher osseous temperatures [19Revie IC, Wallace ME, Orr JF. The effect of PMMA thickness on thermal bone necrosis around acetabular sockets. J Eng Med 1994; 208: 45-51. [http://dx.doi.org/10.1177/095441199420800106] , 20Fukushima H, Hashimoto Y, Yoshiya S, et al. Conduction analysis of cement interface temperature in total knee arthroplasty. Kobe J Med Sci 2002; 48(1-2): 63-72. [PMID: 12151722] ] during polymerisation. Due to heat dissipation, metal tibial trays should have a lower peak temperature than the all-polyethylene trays [12Li C, Kotha S, Mason J. Evaluation of the effects of implant materials and designs on thermal necrosis of bone in cemented hip arthroplasty. Biomed Mater Eng 2003; 13(4): 419-28. [PMID: 14646056] ]. Our primary hypothesis was that modern tibial cementing techniques, without component or cement pre-cooling would result in maximum cement bone interface temperatures of less than 44°C for one minute. Our secondary hypothesis was that higher average maximum polymerisation temperatures would occur with greater cement penetration and with the all-polyethylene tibias. Ethics approval was obtained from the institution’s human ethics research committee. Eight adults, six males with average age 66.88 years (range 62-74 years) fresh frozen at -20°C cadaveric tibia were defrosted & warmed to 21°C. All tibias were wrapped in large saline soaked gauze during defrosting and usage to prevent drying out. Each tibia was randomized using a random number software generator to receive either a metal tibial tray or an all-polyethylene tibial tray, resulting in five metal tibial tray (titanium-aluminum-vanadium) components and three all-polyethylene components Genesis II (Smith & Nephew, Memphis TN, USA) being inserted into the eight cadaveric tibia. Component sizing was undertaken using a best-fit technique. The tibial surface preparation was undertaken using the standard described operative techniques and instruments for the Genesis II (Smith & Nephew, Memphis TN, USA), by a fellowship trained arthroplasty surgeon, using an extra-medullary jig system to perform the proximal bone resection. Saline lavage was undertaken during the proximal tibial osteotomy to minimize saw blade heating. Prior to tray implantation, four 2mm holes were drilled parallel and increasingly inferior to the cut tibial proximal surface from the anteromedial cortex. The initial hole was 1.5mm from the tibial surface, the second was 4.5mm, the third 7.5mm, and final hole was 12 mm from the proximal tibial resection (Fig. 1 ). Thermocouple placement in cadaveric proximal tibia. All four holes were drilled to end at a position halfway between the cortex and stem position. Four single bare wire 0.5mm thermocouples were then inserted into the osseous holes. A type K thermocouple (Labeled Mantle) was placed onto the resected tibial surface so that once the tibial tray was impacted it was contained in the cement layer between the cut tibial surface and the undersurface of the tray (Fig. 2 ). A final thermocouple (Labeled Tray) was attached to the top of the tibial component with adhesive tape. Forty grams of vacuum mixed Simplex P PMMA (Howmedica, Mahwah, NJ, USA) was utilized per cadaveric tibia. The proximal tibial surfaces were prepared using third generation cementation techniques: high volume normal saline lavage, suction drying of the surface, cementing within 3 min of mixing using cement gun pressurization. PMMA monomer, polymer & the tibial tray were at a temperature of 21 °C prior to mixing and implantation. Tibial trays were inserted using tray impaction till osseous contact. Maintenance of pressure till cement solidification was undertaken with 20kg weights applied onto of the tibial tray to mimic at “leg lift”. Excess PMMA was removed to simulate standard operative technique. Polymerization data at the described levels was continuously recorded for 90 minutes using a data logger (DataTaker DT800 Biolab, Scoresby, VIC, Australia) connected to an IBM Laptop using DeLogger 4 software (Biolab, Scoresby, VIC, Australia). After cemented polymerization was complete, the tibias receiving metal trays were sectioned into 10mm thick anteroposterior sections. Each section was digitally photographed with a reference scale and visible osseous cement penetration into each specimen was measured at 10 mm intervals across each tibial section to measure cement penetration at 10mm x 10mm points across the tibia metaphysis. The tibias receiving all-polyethylene trays were not sectioned due to funding constraints. A non-paired two-tailed T Test of the maximum mantle temperatures for the metal & all-polyethylene tibias was undertaken. A Pearson Correlation Coefficient Calculation of tibia mantle maximum temperatures and average cement penetration was also undertaken. P values less than 0.05 were considered statistically significant. Statistical analyses were undertaken using the SOFA Statistics software package (Paton-Simpson & Associates, USA). Averages and standard deviations of tibial maximum temperature in celsius. The maximum temperatures recorded in all tibias was 37.76°C for the tibial trays, 48.03 °C for the mantles, 44.07 °C at 1.5mm below the resected surface, 39.81 °C at 4.5mm, 40.65 °C at 7.5mm and 34.41 at 12mm. All osseous thermocouples registered a temperature rise with cement polymerization, with an average temperature decrease of 0.67 °C per millimetre from the tibial surface. Average maximum temperatures and range in the tibial cadaveric models is detailed in both Fig. (1 ) and Table 1. Average maximum mantle temperature was 39.13°C (95% confidence interval ± 3.99). Temperature began rising at an average of 6 min 34 s (SD 66.8 s)(range 5 min 13s - 8 min 58s), with average time to peak temperature 10min 39s (SD 64.7s) (range 9 min 6s - 12 min 7s). 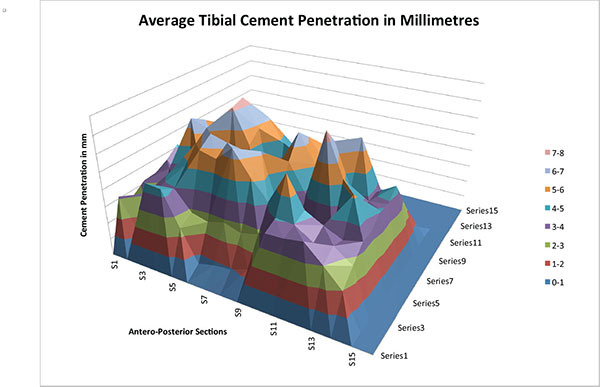 Average tibial cement penetration in millimetres. Temperatures greater than 44 °C were recorded at three sites in two different tibias. A maximum mantle temperature of 48.03 °C at 9 mins 19.5s post mixing was recorded in an all polyethylene tibia. The mantle temperature in this tibia remained above 44 °C for 55 seconds, with a temperature peak at 1.5mm below the tibial mantle of 41.78 °C. A metal tray tibia recorded a maximum temperate in the mantle of 44.65 °C (greater than 44 °C for 33 seconds) at 6 minutes and 6s, 44.07 °C (greater then 44 °C for 10 seconds) at 1.5mm below the surface and dropped to 39.81°C 4.5mm below the mantle. The average margin of thermal safety in all tibias, i.e. maximum mantle temperature minus 44 °C, was 4.95 °C (95% confidence interval ± 4.31). In all tibias, the maximum temperatures were lower at 12.5mm below the tibial surface than at 1.5mm below the tibial surface. The differences in mantle maximum temperatures between the all polyethylene and the metal tibial trays were not statistically significant (p = 0.2). Average cement penetration in the metal tibia trays was 4.14mm (95% confidence interval ± 1.45mm). The average penetrations across each section are detailed in Fig. (3 ). A Pearson Correlation Coefficient Calculation (r=0.42) revealed no statistically significant correlation (p=0.48) between average cement penetration and maximum mantle temperature. Aseptic loosening of the tibial component following total knee arthroplasty is a common cause of TKA complication and failure, often requiring revision surgery. Modern cementing techniques during TKA are used to increase cement penetration depth at the proximal tibia, although this has been recommended against due to a possible thermonecrosis risk. Insufficient investigation into the thermal characteristics of PMMA during total knee arthroplasty using modern cementing techniques has been undertaken. The use of cadaveric tissue created some study weaknesses. Theoretically, peak polymerisation temperature is a function of volume to surface area ratio and the heat conduction properties of the local environment, such as implant material type and bone fluid content. The cadavers had varied water content, despite attempts to avoid specimens drying, this may have altered thermoconduction and may have contributed to some of the temperature variances. The cadaveric investigations were at room temperature as it was difficult to warm cadaveric tissue, and as a result peak temperatures may have been even higher if the tissues were at body temperature. Although, typically the proximal tibia is exposed to operating room ambient temperatures as a result of surgical exposure for an extended period of time during implantation. Cadaveric tissue obviously lacks local tissue blood flow, which could reduce maximum cement temperatures. However, most TKA are commonly undertaken without local blood flow around the knee due to the use of an arterial tourniquet [21Zhang W, Li N, Chen S, Tan Y, Al-Aidaros M, Chen L. The effects of a tourniquet used in total knee arthroplasty: a meta-analysis. J Orthop Surg 2014; 9(1): 13. [http://dx.doi.org/10.1186/1749-799X-9-13] [PMID: 24602486] ], removing local blood flow as a heat dissipater. Hence our tibial cadaveric model represented a reasonable approximation of the proximal tibia during component implantation. As previously reported [22Pijls BG, Valstar ER, Nouta K-A, et al. Early migration of tibial components is associated with late revision: a systematic review and meta-analysis of 21,000 knee arthroplasties. Acta Orthop 2012; 83(6): 614-24. [http://dx.doi.org/10.3109/17453674.2012.747052] [PMID: 23140091] ], thermal injury to bone is both time and temperature dependent, with temperatures at or below 44 °C reportedly not producing osseous injury but temperatures of 47-50 °C applied for more than one minute resulting in bone reabsorption and vascular injury. Bone reabsorption soon after implantation would lead to component migration and increased risk of failure. In none of the cadaveric tibias were temperatures above 44 °C for greater than one minute. However the thermal margin of safety was surprisingly narrow at an average 4.95°C, with two tibias recording temperatures greater than 44°C, one for 55 seconds and the other for 33 seconds. The varied tibial implant material did not significantly alter peak mantle temperatures, even though we had hypothesized the metal trays would conduct heat away from the polymerizing cement better than the polyethylene trays. Thus, the heat conduction properties of metal were not the dominant method of heat conduction as was theorized. Roentgen stereophotogrammetric analysis of cemented knee arthroplasty suggests early component migration occurs soon after implantation. Increased early component migration is associated with later increased prosthesis failure, as for every millimeter increase in component migration there is an 8% increase in the revision rate [22Pijls BG, Valstar ER, Nouta K-A, et al. Early migration of tibial components is associated with late revision: a systematic review and meta-analysis of 21,000 knee arthroplasties. Acta Orthop 2012; 83(6): 614-24. [http://dx.doi.org/10.3109/17453674.2012.747052] [PMID: 23140091] ]. Pijls et al suggests migration of up to 0.5 mm is considered reasonable during the first postoperative year, while migration of 1.6 mm or more is undesirable. Previously described causes of migration include saw blade temperature induced thermonecrosis [23Larsen ST, Ryd L. Temperature elevation during knee arthroplasty. Acta Orthop Scand 1989; 60(4): 439-42. [http://dx.doi.org/10.3109/17453678909149314] [PMID: 2816321] ], direct PMMA cellular toxicity [24Hulliger L. Studies on the effect of artificial resins (palacos and ostamer) in tissue cultures. Arch Orthop Un fallchir 1962; 54: 581-8. [http://dx.doi.org/10.1007/BF00415596] ], and thermal injury due to PMMA polymerization temperatures [25DiPisa JA, Sih GS, Berman AT. The temperature problem at the bone-acrylic cement interface of the total hip replacement. Clin Orthop Relat Res 1976; (121): 95-8. [PMID: 991524] ] Due to these thermal injury concerns, prosthesis cooling [26Wykman AG. Acetabular cement temperature in arthroplasty. Effect of water cooling in 19 cases. Acta Orthop Scand 1992; 63(5): 543-4. [http://dx.doi.org/10.3109/17453679209154733] [PMID: 1441953] ], cement cooling [24Hulliger L. Studies on the effect of artificial resins (palacos and ostamer) in tissue cultures. Arch Orthop Un fallchir 1962; 54: 581-8. [http://dx.doi.org/10.1007/BF00415596] ], thin cement mantles [20Fukushima H, Hashimoto Y, Yoshiya S, et al. Conduction analysis of cement interface temperature in total knee arthroplasty. Kobe J Med Sci 2002; 48(1-2): 63-72. [PMID: 12151722] ], and PMMA chemical composition alteration to lower polymerisation temperatures during TKA have been suggested [27Lee HB, Turner DT. Temperature control of a bone cement by addition of a crystalline monomer. J Biomed Mater Res 1977; 11(5): 671-6. [http://dx.doi.org/10.1002/jbm.820110504] [PMID: 893489] , 28Brauer GM, Steinberger DR, Stansbury JW. Dependence of curing time, peak temperature, and mechanical properties on the composition of bone cement. J Biomed Mater Res 1986; 20(6): 839-52. [http://dx.doi.org/10.1002/jbm.820200614] [PMID: 3722218] ] however tibial implants cemented with modern cementing techniques have results that are similar or superior to modern cementless tibias [1AJR. Australian Orthopaedic Association National Joint Replacement Registry Annual Report 2013 [Internet] 2013. Australian National Joint Registry; 2013 [cited 29th Jun 2014]. Available from: https://aoanjrr.dmac.adelaide.edu.au/documents/10180/127202/Annual%20 Report%202013?version=1.2&t=1385685288617]. Our study suggests that modern tibial cementing techniques result in a narrow thermal safety margin. These techniques used in cadaveric tibias resulted in maximum mantle temperatures that are on average 4.95°C (95% confidence interval ± 4.31) below the thermal safety margin for osseous injury. All osseous thermocouples registered a temperature rise with cement polymerization, with an average temperature decrease of 0.67°C per millimetre from the tibial surface. Average maximum mantle temperature was recorded at 39.13°C (95% confidence interval ± 3.99) . Cement penetration depth did not correlate with maximum cement temperature. These results suggest that a) methods to increase cement penetration depth will not result in greater maximum cement mantle temperatures and b) early migration of some cemented tibial implants due to thermally induced bone remodeling warrants further investigation. The authors CV, DZ, FV & WW declare no relevant conflict of interest. The authors wish to thank Stephen McLeod for his assistance in cadaveric specimen preparation. Kurtz SM, Ong KL, Lau E, Bozic KJ. Impact of the economic downturn on total joint replacement demand in the United States: updated projections to 2021. J Bone Joint Surg Am 2014; 96(8): 624-30. Walker PS, Soudry M, Ewald FC, McVickar H. Control of cement penetration in total knee arthroplasty. Clin Orthop Relat Res 1984; (185): 155-64. Dorr LD, Lindberg JP, Claude-Faugere M, Malluche HH. Factors influencing the intrusion of methylmethacrylate into human tibiae. Clin Orthop Relat Res 1984; (183): 147-52. Banwart JC, McQueen DA, Friis EA, Graber CD. Negative pressure intrusion cementing technique for total knee arthroplasty. J Arthroplasty 2000; 15(3): 360-7. Kim YH, Walker PS, Deland JT. A cement impactor for uniform cement penetration in the upper tibia. Clin Orthop Relat Res 1984; (182): 206-10. Ritter MA, Herbst SA, Keating EM, Faris PM. Radiolucency at the bone-cement interface in total knee replacement. The effects of bone-surface preparation and cement technique. J Bone Joint Surg Am 1994; 76(1): 60-5. Vertullo CJ, Davey JR. The effect of a tibial baseplate undersurface peripheral lip on cement penetration in total knee arthroplasty. J Arthroplasty 2001; 16(4): 487-92. Huiskes R, Sloof TJ. Thermal injury of cancellous bone following pressurzed penetration of acrylic cement. Trans Orthop Res Soc 1981; 6: 134. Huiskes R. Some fundamental aspects of human joint replacement. Analyses of stresses and heat conduction in bone-prosthesis structures. Acta Orthop Scand Suppl 1980; 185: 1-208. Seeger JB, Jaeger S, Bitsch RG, Mohr G, Röhner E, Clarius M. The effect of bone lavage on femoral cement penetration and interface temperature during Oxford unicompartmental knee arthroplasty with cement. J Bone Joint Surg Am 2013; 95(1): 48-53. Li C, Kotha S, Mason J. Evaluation of the effects of implant materials and designs on thermal necrosis of bone in cemented hip arthroplasty. Biomed Mater Eng 2003; 13(4): 419-28. Meyer PR Jr, Lautenschlager EP, Moore BK. On the setting properties of acrylic bone cement. J Bone Joint Surg Am 1973; 55(1): 149-56. Preininger B, Matziolis G, Pfitzner T, Hardt S, Perka C, Röhner E. In situ tele-thermographic measurements during PMMA spacer augmentation in temporary arthrodesis after periprosthetic knee joint infection. Technol Health Care 2012; 20(4): 337-41. Ohnsorge J, Kroesen A. Thermoelectric temperature measurements of the tempered bone cement, “Palacos”. Z Orthop Ihre Grenzgeb 1969; 106(3): 476-82. Albrektsson T, Eriksson A. Thermally induced bone necrosis in rabbits: relation to implant failure in humans. Clin Orthop Relat Res 1985; (195): 311-2. Eriksson RA, Albrektsson T. The effect of heat on bone regeneration: an experimental study in the rabbit using the bone growth chamber. J Oral Maxillofac Surg 1984; 42(11): 705-11. Whitehouse MR, Atwal NS, Pabbruwe M, Blom AW, Bannister GC. Osteonecrosis with the use of polymethylmethacrylate cement for hip replacement: thermal-induced damage evidenced in vivo by decreased osteocyte viability. Eur Cell Mater 2014; 27: 50-62. Revie IC, Wallace ME, Orr JF. The effect of PMMA thickness on thermal bone necrosis around acetabular sockets. J Eng Med 1994; 208: 45-51. Fukushima H, Hashimoto Y, Yoshiya S, et al. Conduction analysis of cement interface temperature in total knee arthroplasty. Kobe J Med Sci 2002; 48(1-2): 63-72. Zhang W, Li N, Chen S, Tan Y, Al-Aidaros M, Chen L. The effects of a tourniquet used in total knee arthroplasty: a meta-analysis. J Orthop Surg 2014; 9(1): 13. Pijls BG, Valstar ER, Nouta K-A, et al. Early migration of tibial components is associated with late revision: a systematic review and meta-analysis of 21,000 knee arthroplasties. Acta Orthop 2012; 83(6): 614-24. Larsen ST, Ryd L. Temperature elevation during knee arthroplasty. Acta Orthop Scand 1989; 60(4): 439-42. Hulliger L. Studies on the effect of artificial resins (palacos and ostamer) in tissue cultures. Arch Orthop Un fallchir 1962; 54: 581-8. DiPisa JA, Sih GS, Berman AT. The temperature problem at the bone-acrylic cement interface of the total hip replacement. Clin Orthop Relat Res 1976; (121): 95-8. Wykman AG. Acetabular cement temperature in arthroplasty. Effect of water cooling in 19 cases. Acta Orthop Scand 1992; 63(5): 543-4. Lee HB, Turner DT. Temperature control of a bone cement by addition of a crystalline monomer. J Biomed Mater Res 1977; 11(5): 671-6. Brauer GM, Steinberger DR, Stansbury JW. Dependence of curing time, peak temperature, and mechanical properties on the composition of bone cement. J Biomed Mater Res 1986; 20(6): 839-52.